We're bringing flexi back! You would never expect this much comfort and flexibility from a stack chair. 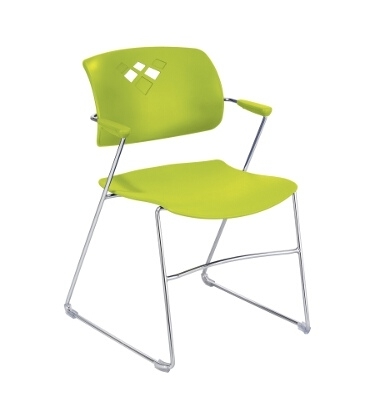 Its fluid movements result in superior comfort and adaptability across your workspace. The Veer Stack Chair blends style with a back that arches with the body's natural curves to give relaxing support whether It's an extra seat for a meeting or a roomful for a presentation. With so much flexibility, Veer Stack has got your back. The chair features non-marring floor glides and can stack up to 12 high on the floor and 28 high on a cart. Available in three colors: Grass (GS), Blue (BU) and Black (BL). Packed 4 per carton. Limited Lifetime Warranty.